If your business is structured as a partnership, your business doesn’t pay taxes. Instead, each partner pays taxes on the money earned by the business, which is split up among the partners. You need to collect the data necessary to file an information schedule called Schedule K-1 (Form 1065), Partner’s Share of Income, Deductions, Credits, etc. as a partner. You or your business accountant completes the Schedule K-1 form, shown in this figure. 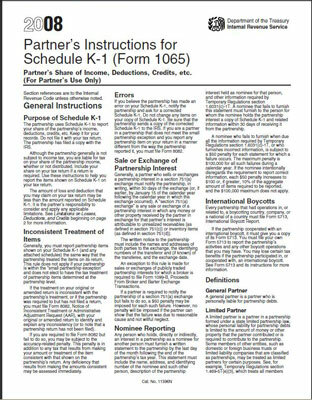 The entire information filing for the partnership is called Form 1065. 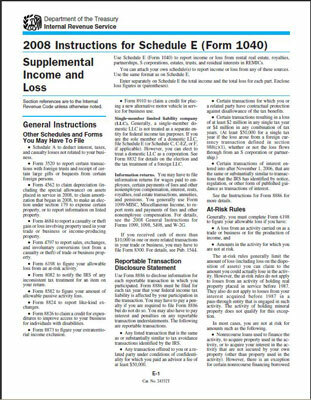 Any partner receiving a Schedule K-1 must report the recorded income on his or her personal tax return — Form 1040 — by adding an additional form called Schedule E, Supplemental Income and Loss (see these figures). Schedule E is used to report income from more than just partnership arrangements; it also has sections for real estate rental and royalties, estates and trusts, and mortgage investments. Unless you’re involved in a real estate rental business, you most likely only need to fill out page 2 of Schedule E.
In Part II of Schedule E (Income or Loss From Partnerships and S Corporations), you report your income or loss as passive or non-passive income, a distinction that your accountant can help you sort out.